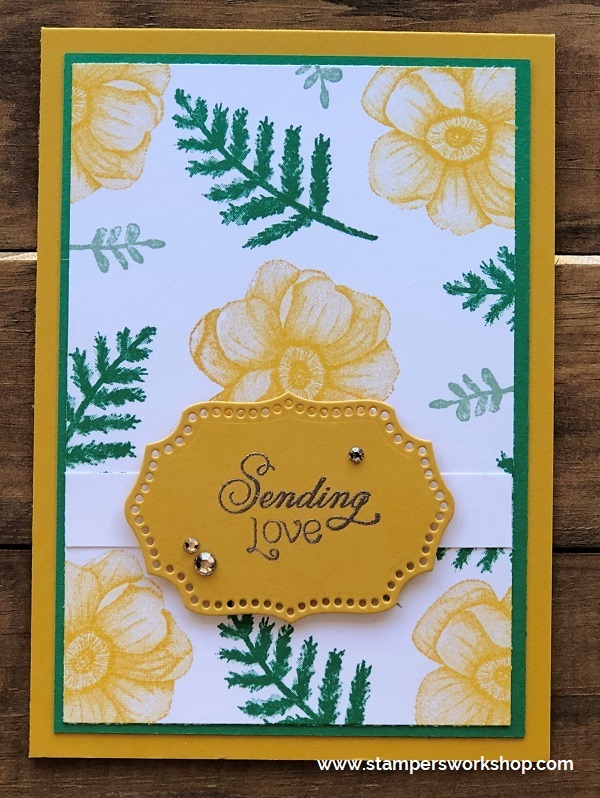 Hi everyone, after sharing a card inspired by my friend, and upline, Melissa a few days ago, I was enjoying a conversation with another stamping enthusiast about ways you could adapt this design. Next thing I know, I am back at my stamp table and the following card comes into existence. To create today’s card I again used the Painted Seasons stamp set, and the Painted Seasons DSP, as well as the Amazing Life stamp set for the sentiment. As I had chosen brighter colours to create the last card, I decided to go for a much softer colour palette. Pool Party is definitely one of my favourite colours in the Stampin’ Up! range. What makes this card a little different is that the card front ends with the flowers. The patterned paper actually adheres to the inside of the card. 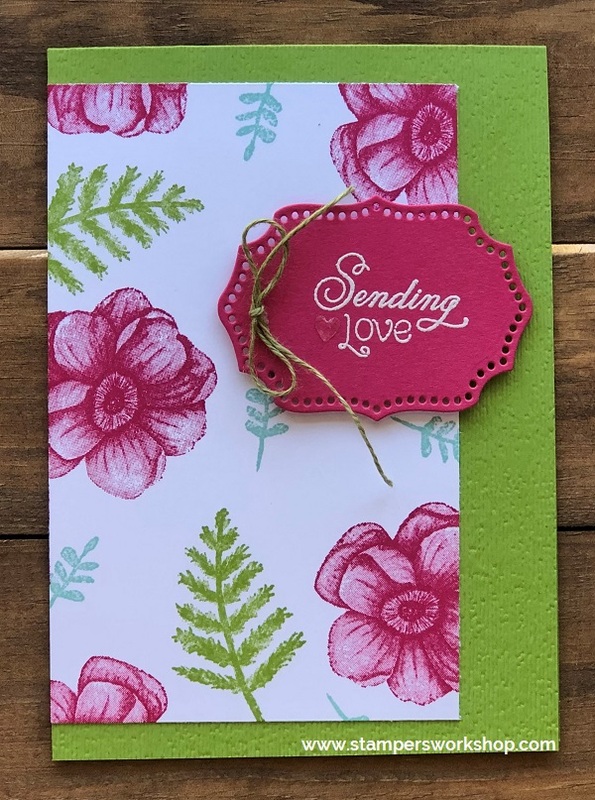 I don’t have the coordinating dies for this stamp set yet but it would have been perfect for this card as I would have die cut a bunch of the flowers in Whisper White cardstock and adhered them on inside of the card to cover up the joins. It doesn’t look too bad, but it would have just given a nicer finish. I’m sorry the photo isn’t better quality. I had lighting issues and couldn’t quite catch the sun at the right time. 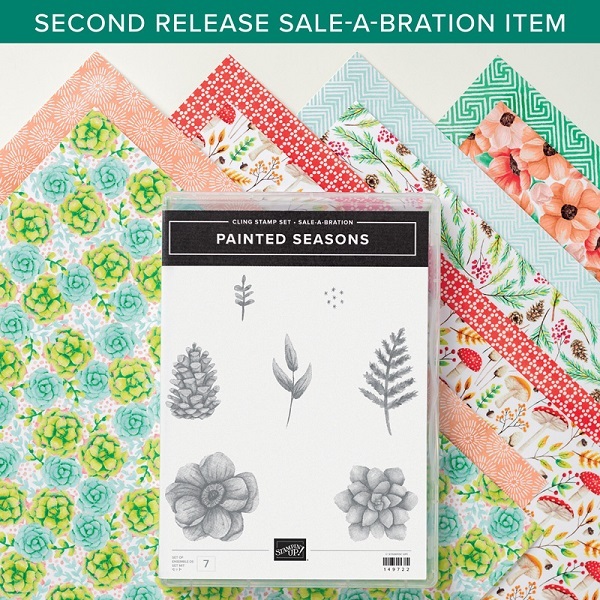 The Painted Seasons stamp set and the coordinating Designer Series Paper (the DSP is also available separately) is FANTASTIC but they will only be around until the end of the month. I’m going to be sad to see them go. Hi everyone, my friend, and upline, Melissa, shared a GORGEOUS card on our stamping group today. I loved it so much and asked her if she wouldn’t mind me CASE-ing it. Graciously, she said I could! For this card, I used the Painted Seasons stamp set, the Painted Seasons DSP, and the Well Written Framelits dies. My colour choice was inspired by the Painted Seasons DSP as I knew I would be including some of this paper in my card design. In the end, I went with Call Me Clover for the leaves and Poppy Parade for the flowers. Such a great combination. I think it would also be a great colour combination when making Christmas cards too. You might have noticed that I let the flowers overhang on each edge. I made a bit of a mistake with this card as I should have cut down the card a little to account for this feature. The card is now a little too big for a regular envelope. Fortunately, you can use the Envelope Punch Board to make a customised envelope to cater for this extra length. My other tip with this card is to be careful when applying the Wink of Stella to the flowers as it WILL move the ink. I’m very thankful to Melissa for letting me CASE her card. If you decide to CASE this design too, I’d love to see what you come up with. Hi everyone, happy Blog Hop day! 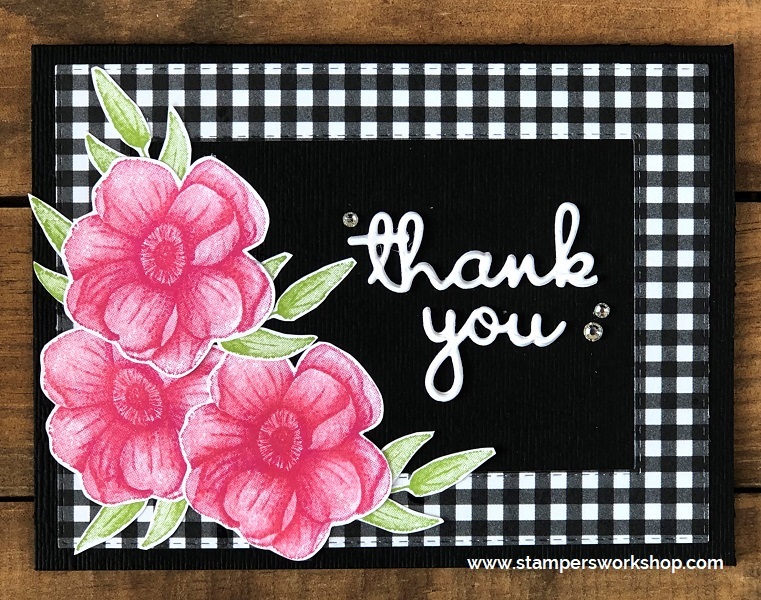 Some of the lovely ladies from the Stampers Anonymous team have joined together to participate in a fun blog hop. 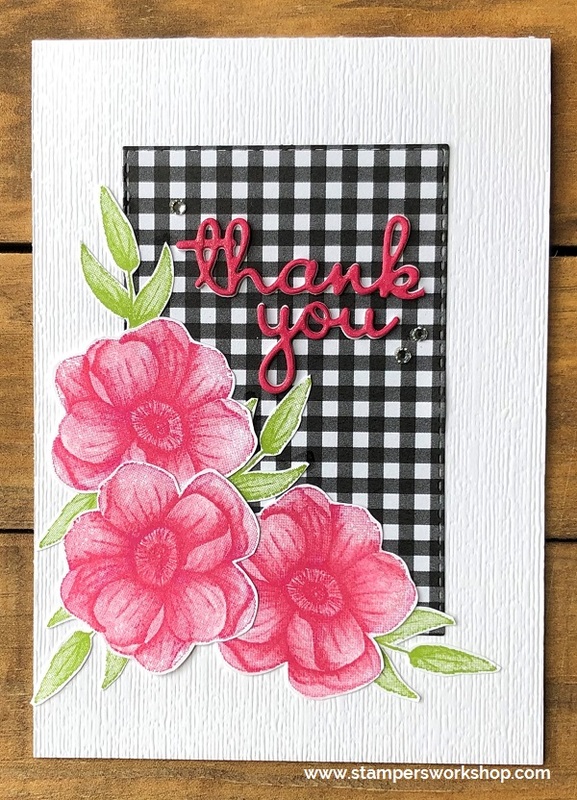 The theme for this Blog Hop challenge was to use any Sale-A-Bration stamp set. Now, this wasn’t too much of a challenge at all for me as I cannot seem to stop playing with all the Sale-A-Bration goodies. 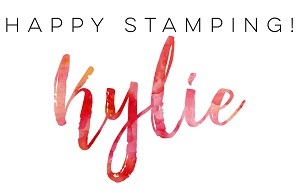 I chose to feature the Painted Seasons stamp set – such a pretty set! I stamped the floral image in Melon Mambo and the leaves in Granny Apple Green. The black gingham paper is from the Botanical Butterfly DSP. You might recall a card I shared a few days ago when I made a frame in the gingham paper. I used the centre panel for the card below. The sentiment was created with the fabulous Well Written dies. I *love* these dies! I finished off with a layer of Wink of Stella over the flowers and the sentiment. 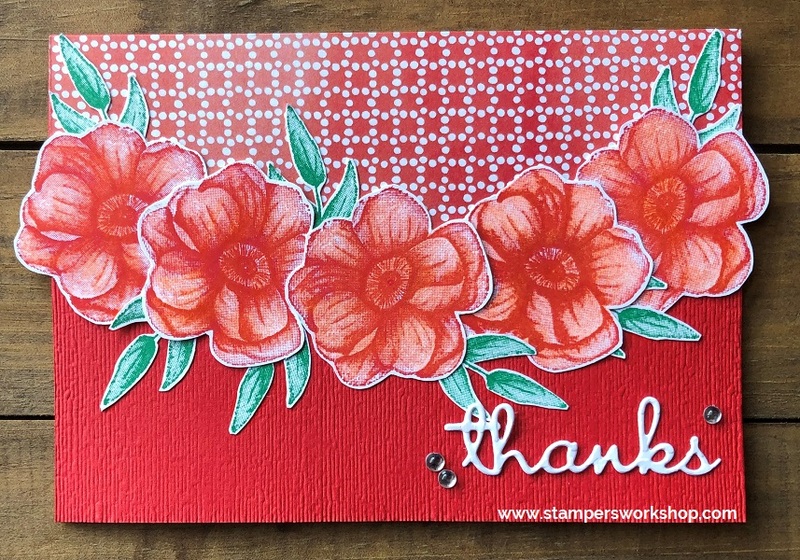 I loved this challenge and I hope you love seeing all the inspiration from my fellow Stampers Anonymous Team Members. They are pretty darn talented ladies. I hope you’ll also consider playing along as we would all love to see what you are creating, Enjoy the rest of the hop! Hi everyone, do you ever get stuck in a creative rut? Do you use the same stamp sets, the same colouring mediums, and even the same colour palette? I do. I love using certain things and I reach for them again and again. Now, to be honest, whilst I called it a rut earlier, I don’t actually think it is a bad thing. With repetition, we really begin to learn how to use products, techniques and we learn all about colours which work together. I’m actually a big fan of it. Having said that, today I decided to try and push myself out of my comfort zone. I stayed with a design and technique I am comfortable with but I went for a completely different colour palette! Oh boy, that was hard! The colour palette I chose was Crushed Curry, Call Me Clover and Mint Macaron. This palette was one recommended by Stampin’ Up! To be honest, I’m not a huge fan of yellow. I like little highlights, for sure, or the odd flower but a card where it is the focus…never. 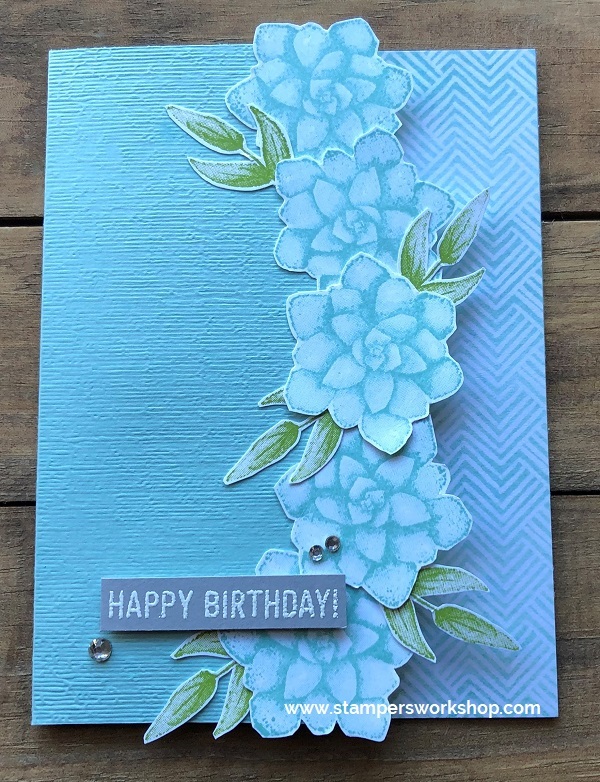 I CASED the card I made using the Painted Seasons stamp set, the Climbing Roses stamp set and the Rose Trellis bundle. You can see my original card here. I followed the exact same card design only switching out the sentiment. When I was finished I didn’t like the card. The more I look at it though, the more it grows on me. I’d love to challenge you all to do the same thing. Pick a new colour palette from colours you NEVER (or rarely use) and make a card. You could CASE an old card you’ve made but do try some new colour combinations. You might not think you are going to like the result but you might just stumble across a combination you do love! Hi everyone, while I had all my supplies out to create yesterdays card I thought I might make up a few more cards but I varied the design a little and wanted to share it with you. I’ve used the same supplies – the Painted Seasons bundle, the Climbing Roses bundle and even the same colour palette, and yet the card looks quite different. Just between you and me, I added to Heart Epoxy Droplet to the sentiment panel but I didn’t like my positioning or even the size of heart I had chosen to use. I knew I was going to ruin my panel if I tried to remove it. The best way I could think of to draw attention away from the heart was to add the Old Olive Linen Thread bow. The ended up being one of my favourite elements on the card. It is a little darker than the Granny Apple Green I used but it still suited the card perfectly. Never give up on an idea that goes a little wonky. There’s generally always a way to save it. Don’t forget the recipient isn’t going to know the card isn’t exactly as you had planned for it to be. It’s our little secret! Hi everyone, the Painted Seasons bundle is SO PRETTY! I love the new stamps. 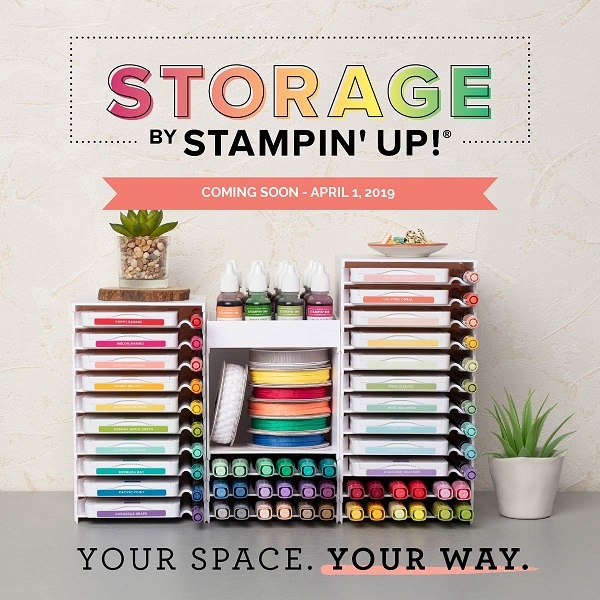 They are the new Distinktive type of stamp set developed by Stampin’ Up! and they show such lovely detail. I wanted to use every stamp in the set as soon as I opened the case. The easiest way to use a few of the stamps at the same time was to create my own background paper. This is one of my favourite things to do at the present time. This card features one of my favourite colour combinations – Pool Party, Granny Apple Green and Lovely Lipstick (Melon Mambo is also a good substitute for Lovely Lipstick). Such bold, happy colours. 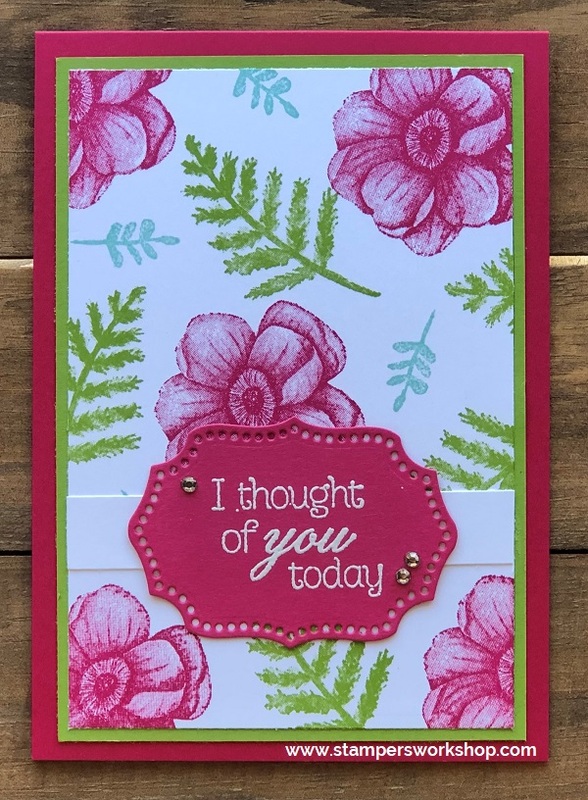 I finished the card off using one of the sentiments from the Climbing Roses stamp set (which is so gorgeous) and I die cut the sentiment using the Rose Trellis Thinlits dies. I really love the dots around the edge of the label. Such a fun finish. Once again, this type of card is so easy to make and I think it packs a real punch. You could definitely experiment with different colour combinations – maybe some earthy, autumnal tones? That could look so great! Ooh, if you substitute the floral image for the pine cone, that would make a really good masculine card. Will definitely have to give that a go! Please note: The Four Seasons Framelits Die in this video is part of the Sale-A-Bration coordination promotion which begins on 1 March. So what do you think of the Painted Seasons bundle? Isn’t it beautiful! If you choose this as your free gift, I’d love to see the things you create with it.